As happens every January, I started 2016 with a determination to read at least a few more books from my shelves than I did last year. 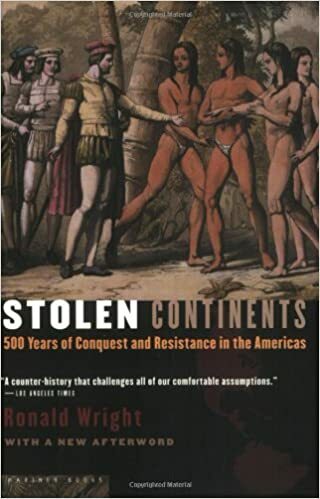 I started with Ronald Wright's Stolen Continents: 500 Years of Conquest and Resistance in the Americas. The subtitle is pretty self-explanatory; it's a book that retells the history of the Americas not as a story of inevitable European takeover, but one in which the native populations fought long and hard for their lands and rights. Wright focuses on five nations in particular: the Aztecs, the Inca, the Maya, the Cherokee and the Iroquois. As you might expect, this book is pretty depressing. There was a tremendous, horrible loss of life when Europeans came to the Americas. Yes, a lot of American Indians died of disease, smallpox in particular, but a lot of them were also brutally murdered and displaced. Reading about the immensity of the plague and the brutality of the killings is a very chilling experience. But it happened, and it's important we acknowledge it. I learned a lot from this book about the politics and religions and social structures of cultures I don't know a lot about. I wouldn't say that I am at all well-read on the subject of treaties or laws with regard to Native American nations, but I have read some books on the subject and they are all depressingly similar. So many broken promises and so much bad treatment. I am always reminded of Charles C. Mann's excellent book 1491, in which he goes into glorious detail about the cultures and beliefs of so many cultures alive and well in the Americas before Europeans arrived. Wright's book is a bit harder to read than Mann's, perhaps because his anger is so obvious that it's hard to think of him as an objective writer. I'm not calling his facts into question, more his interpretation of events and people to always assume the best of anyone who was Native American and the worst of anyone who was not. In a way, Wright fell into the same trap of stereotyping people that he so hated; it was hard to read and not be reminded a little warily of the whole Noble Savage trope. Even so, there are so many eloquent and rich quotes in this book from people that we never learn about in school, and I'm so glad that Wright gave them a voice and the spotlight here. But it's hard to read books that delve into this seedier side of American and world history. It's hard to imagine such a cataclysmic event as smallpox taking out a huge portion of a population, and then a systematic insistence on kicking people when they're down. The racism that is inherent in colonialism, in conquest, in forced religious conversion, is so overwhelming. That it happens through every age of human history, again and again, to so many beautiful and vibrant cultures, is just more depressing. It's like we never learn. I am glad I read this book, but I would still recommend Charles C. Mann's 1491 over it if you want to learn more about pre-First Contact cultures in the Americas. Stolen Continents reminded me a lot of An Indigenous History of the United States. Just because it's hard to read doesn't mean you shouldn't read it. I don't know if he was EVIL, but he was certainly misguided and a product of his time and did evil things. That is a good takeaway!